If you have often imagined yourself piloting your X-Wing fighter on an attack run on the Death Star, you'll be reassured that University of Leicester students have demonstrated that your shields could take whatever the Imperial fleet can throw at you. The only drawback is that you won't be able to see a thing outside of your starfighter. They have published their findings in the Journal of Special Physics Topics, a peer-reviewed student journal run by the University's Department of Physics and Astronomy. The principle can already be seen, not in a galaxy far, far away, but in the atmosphere around our own planet. It is seen in 'over-the-horizon' radio communications, used for decades in early warning RADAR systems and for long distance communications where satellite communications are not feasible. Student Alexander Toohie said: "The Earth's atmosphere is made up of several distinct layers, one of which is the ionosphere. The ionosphere is a plasma, and extends from roughly 50km above the surface of the Earth to the edge of space. "Just like the plasma described in our paper, it reflects certain frequencies of electromagnetic radiation, in this case radio frequencies. Radio communications and RADAR can be beamed upwards toward the sky where it will be reflected back down toward the Earth. This method can be used to send communications over the horizon where radio transmissions would not normally be capable of reaching, much like using a mirror to look around a corner." Alexander explains: "Another possible application of this principle may be for trapping radiation inside a shell of plasma rather than excluding it. This may be useful for applications that require incredibly high temperature environments, such as experimental fusion reactors." The students presented their findings in a paper for the Journal of Physics Special Topics, a peer-reviewed student journal run by the University's Department of Physics and Astronomy. The student-run journal is designed to give students practical experience of writing, editing, publishing and reviewing scientific papers. Alexander said: "This module is very valuable to students who will be staying in academia after graduating as it gives a good insight into the publishing process for academic papers. "But it is also valuable to students who do not intend to continue in research, as it allows us to investigate problems that we are interested in, and also gives us feedback from our peers on our writing style and the way in which we tackle problems." Course tutor Dr Mervyn Roy, a lecturer in the University of Leicester's Department of Physics and Astronomy, said: "The aim of the module is for the students to learn about peer review and scientific publishing. "The students are encouraged to be imaginative with their topics, and find ways to apply basic physics to the weird, the wonderful and the everyday." More information: Journal of Physics Special Topics, J. McGuire, A. Toohie and A. Pohl, Department of Physics and Astronomy, University of Leicester. Leicester, LE1 7RH. Nov 20, 2013. The caption of the top image is completely wrong. 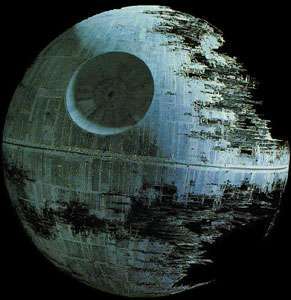 The Death Star pictured is the 2nd Death Star from Episode VI: Return of the Jedi. That Death Star is destroyed by Wedge and Lando. Luke is on the Death Star battling the Emperor and saving his father. Luke destroys the 1st Death Star in Episode IV: A New Hope. That is a completed and 'fully functional battle station'. Deflector shields were from Star Trek. They're in Star Wars too. In Ep IV just after leaving Mos Eisley when the Falcon is being attacked by star destroyers Han says "We're losing our deflector shield. Go strap yourself in, I'm going to make the jump to light speed." There's a dozen other references in the original trilogy. Real military laser weapons typically use the infrared frequencies, so visible light is not necessarily in conflict, though I can only guess at the exact frequency involved since that would be top secret to prevent countermeasures. They may use rotating frequencies to help circumvent countermeasures, but I am not sure whether they are that advanced yet. I've seen rotating frequency methods mentioned in real life, but have not seen it demonstrated on any publicly available media. "We've lost the bridge deflector shield." "Intensify forward fire power to compensate. I don't want anything getting through....Intensify forward fire power NOW..."
I always got the idea that, in Star Wars, they were talking about those big metal plates that hinged into place. There are several scenes that show big mechanical shields swinging up to protect important areas from incoming attack. Now if they can develop this to work to deflect asteroids and prevent potential future extinction events we'll have something. Would a mass like the death start able to create gravity by itself? Of course it wouldnt stop kinetic projectiles, particle beams, exocets, photon torpedos, arrows, rocks, etc. Oh and also xray or uv lasers. Oh well. At least you wouldnt see all that stuff coming at you and so your drawers would remain clean until the end. TheGhostofOtto1923: Back to the 1930s sci-fi, where the ships had cannons, and the boarding crews used swords? If it can block visible light it should be possible to design a version that would block at least some UV, as it's still electromagnetic radiation. Far-UV and X-rays would probably contain enough energy to disrupt the magnetic fields. I wonder if the cameras could be put on non-magnetic booms, so they could be extended periodically for navigation, then retracted for protection? Not practical. You probably couldn't use a wired connection from the camera to the cockpit because it will get interfered with, and then you can't use a magnetic storage media because that will get erased, and even if you used a non-magnetic storage media, it's not very practical in a dog fight to watch a video recording of what was happening 30 seconds or 2 minutes ago. Wow I learned something here. Didn't realise you chaps were so 'up' on star wars/star trek. I always wondered if they needed a 'protector field' to protect from possible harm from the 'deflector shield'. I can't wait for the day when DS's automatically form over damage/open areas (First Contact, Nemesis). Dream on eh? Returners: An optical link in a shielded cable or conduit would work. The shielding would keep the plasma out, and light in a fiber isn't bothered by magnetic fields or radio frequency radiation. For any sensing scheme that pokes things through the shield, consider what happens when plasma contacts relatively cold solid matter. Anyone here remember Niven/Pournelle's "The Mote In God's Eye"? Their ships used a shield with the same limit - those inside couldn't see out. It had the added disadvantage of absorbing rather than reflecting the energy, and would explode if overloaded. Reminding me of Niven's Known Space - not the same milieu, but full of fun-to-ponder science concepts. Of course, if something like a ring world came sailing through our solar system today, we would be able to do little more than watch it pass by. "Radio communications and RADAR can be beamed upwards toward the sky where it will be reflected back down toward the Earth. This method can be used to send communications over the horizon where radio transmissions would not normally be capable of reaching, much like using a mirror to look around a corner." Not sure this author even knows what he is talking about. The ionosphere only bounces radio signals back to earth, with any consistency, those radio signals below around 30 Mhz except on some occasions higher frequencies can get this skip effect Signals above that, the wavelength is too short and they penetrate the ionosphere and do not return to earth. Over the horizon radar at these low frequencies has very low resolution. Ham radio operators use this skip phenomenon every day to talk to other hams all over the world. Anything with mass creates it's own gravity. Well also in star wars, I'd wager that all the "lasers" fired are, in fact, plasmas of some form or another. Why they're colored and move significantly slower than the speed of light (or a bullet for that matter, in some cases). If you want to protect against laser light you'd be better off with a an adaptable (to frequency) and ablative coating of "smart" nano particles. Wouldn't last indefinitely, but would give you much better protection for no expenditure of energy and no visibility problems. You do realize that not everyone in the world is a Star-Trek geek/nut. Slightly off the topic - Can 'space time' instead, be wrapped around the ship and be used as shield to deflect incoming laser rays / projectiles ?. Any academic paper around this idea would be interesting to read.. Which predated the light-headed fantasy that is Star Wars by nearly 15 years. These students may know a lot about physics; but they know nothing about radar. Radar is designed to receive between transmission pulses. Likewise, lasers pulse coherent light frequencies. Plasma shields could pulse as well, as the pulse repetition rate of the laser, enabling communications or electromagnetic weapons to transmit between pulses. They should watch a few more "Star Trek" episodes, as this is pointed out on at least one episode. Also, the power source would NOT have to be on the ship. All that is needed is a magnetic resonance receiver. Everything from cell phones to buses to a ferry in Sweden are already charged in this manner. That's cool. You could deflect laser weapons. Wouldn't it be fun to defeat this high tech shield with a low tech projectile weapon? I swear, one day advanced nations will find themselves defeated by sticks and stones. Just a slight problem: the space weapons depicted in Star Wars are clearly NOT lasers. A laser would travel at the speed of light, and it would not be visible from the side while propagating in space, unless it passes through some sort of scattering medium. So, if the Star Wars space weapons (and handheld guns) are really plasma pellet shooters, then a strong magnetic field would clearly suffice as a 'deflector'. Anyone read the book Unconventional Flying Objects a scientific analysis (429 pages) by Paul R Hill a former NASA scientist. Okay, it IS aimed at UFO's but tries to explain effects in term of our current position in physics (1995 that is). The author attempts to explain certain force fields and their effects in realistic terms. The book also contains the math that the author has used in experiements while working at NASA. I admit that most of the force fields mentioned in the book are not viewed as deliberate defence (although some come could be) but as possible consequence of using certain methods of propulsion. SR, Graivtation and Qm are considered. UFO's, Star Wars Star Trek aside I think it gives an interesting view, to the layman that is, of what our 'classified' scientists MIGHT be working on. No intention to advertise this book and has no connection to me. I'd like to hear from those who might read other similar texts. ASIA FOR THE ASIANS, AFRICA FOR THE AFRICANS, WHITE COUNTRIES FOR EVERYBODY!blah blah blah They say they are anti-racist. What they are is anti-white. this is a SCIENCE SITE, not a political, racist, conspiracy-theory forum... if you want to make friends here, you need empirical evidence and scientific knowledge, not whack-job soliloquy's supported only by your delusional outlook. Ok, since now we know we can create an Electromagnetic field around an object without frying the inhabitants of whatever the field is around now we can begin working on creating a field that is the exact same frequency of the Electromagnetic field created from a star. The resulting action will propel the object through space without the need for propulsion, instead the act of repulsion of two equal fields. The only way we are going to get off this rock is to find a way to use the Electromagnetic Fields created by our own star for the energy for travel, and repulsion and attraction using Electromagnetic fields are the two best candidates. Our logic and teaching are flawed from childhood, we are taught that space is an empty vacuum but nothing could be further from the truth. Space is a constant bath of Electromagnetic fields and energy that can be utilized when we learn how to harness it. -Nor is it hard to imagine that they would develop tactics to avoid this sort of thing. The battle at the end of Babylon 5 was only artistic licence. It's called photovoltaics and every sattelite already uses it. If you want to use the EM field for motion you use a solar sail. Yeah, because it seems to have failed to teach you about conservation of momentum. we are taught that space is an empty vacuum but nothing could be further from the truth. I dunno where you were taught, but the idea of photons isn't particularly new. Vacuum refers to the absence of MATTER. Not EM radiation. I could be wrong, but I dont think the upper atmosphere plasma reflects radio frequencies based on plasma density. I think it is the difference of indices of refraction which causes "total internal reflection". That only works when the index of the 1st medium (lower atmosphere) is higher than that of the 2nd medium (upper atmosphere). So an interface between vacuum (lower) to plasma (higher) wont work as a reflective device. About me and plasma research. I have been a electronic engineer and technical writer in the defense industry for over 40 years. Plasma research has been under development has been under development for 20 at places like Princeton University in New Jersey. These students have done absolutely nothing new ACCEPT plagiarism, which is not an amusing matter! People have been sued over it. I strongly suggest you either lose this article or amend it!! !